Unlike in the West, in Japan it’s primarily girls who hand out gifts of chocolate on Valentine’s Day. Although the most common pattern is for a woman to give sweets to her boyfriend or secret crush, the holiday’s scope has been expanded to include relatives, coworkers, or any guy whose kindness she feels indebted to, regardless of whether there’s any romantic sentiment involved or not. In recent years, the recipient doesn’t even have to be a real person, as this giant haul of Valentine’s Day chocolate for a single anime character proves. The popular guy all those gifts are addressed to is Shusuke Fuji, from the ever-popular manga and anime Prince of Tennis. While the series is ostensibly about a group of high school tennis stars, the real draw of the series isn’t so much the sport itself as it is the chance to see its long-limbed, carefully coifed cast of young male athletes running around in shorts. ▼ The fine-featured Shusuke looks like he’d have no problems stabbing you to death with his chin, nose, or even eyelashes. 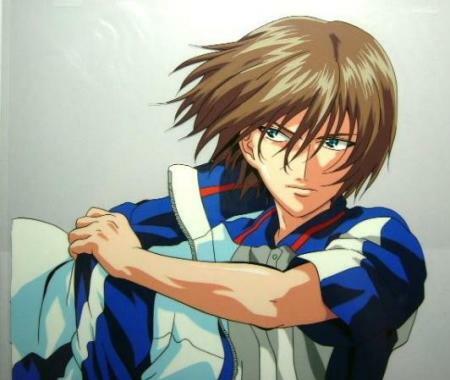 But what caused Shunsuke, out of Prince of Tennis’ extensive cast of handsome dudes, to be the singled-out recipient of so much Valentine’s Day chocolate? It might have something to do with his family name. The kanji characters for Fuji (不二) also happen to be the first two characters in the name of of Fujiya (不二家), one of Japan’s most successful confectioners. One of Fujiya’s biggest sellers is its line of Look chocolates, sold in inexpensive packs at grocery stores and convenience stores across the country. So what happens when you combine one of Japan’s most popular pretty boy anime with one of its most popular brands of candy? You get 8,000 boxes sent for Shunsuke to Prince of Tennis’ publisher already, with over a week still to go until Valentine’s Day. Shocking as the quantity may be, Prince of Tennis creator Takeshi Konomi says that every year fans send in mountains of chocolates. Last year such gifts came for 124 different characters (we weren’t kidding when we said the series has a large cast), with the grand total being a staggering 44,570 boxes. Even still, Konomi expressed his surprise at Fuji’s amazing haul, given that only two characters broke the 3,500-box barrier last year, and Fuji himself finished eighth overall with just 1,125 boxes. Whatever the reason, Fuji’s popularity seems to be rising, at the same time the animation and manga production team’s waistlines are likely to be expanding.